In Valencia Region (Spain), some wild and cultivated sages are used for medicinal purposes. Among them, Salvia officinalis subsp. lavandulifolia (SL) is widely employed and known for production of Spanish sage oil and herbal products. Nevertheless, it shares the market with S. blancoana subsp. mariolensis (SB) and, to a lesser extent, with their hybrid S. x hegelmaieri (SH). The knowledge on these two species is far low and confusion between them is possible. The aim of the present paper is to improve the ethnopharmacological, morphological and chemical knowledge of these sages, and to contribute to setting up quality specifications for improving identification and distinction from other Salvia species, such as, S. officinalis subsp. officinalis, S. x auriculata and S. microphylla var. microphylla. Samples were collected in Valencia Region and surrounding mountain areas during the ethnopharmacological field work. Twenty-nine medicinal uses were reported for SL, 13 of them being also recorded for SB. Of particular interest is a homemade liquor, used as digestive and known as “salvieta,” which is mainly prepared with SB. The macro- and microscopic characters are insufficient for identification of cut, crushed or powdered material. The study of the essential oil and a HPTLC (High Performance Thin Layer Chromatography) fingerprint of their extracts could help to distinguish SB from the other sages. The essential oil from dried aerial parts of SB (content: 1.8–4.5%) was characterized by GC-FID (Gas Chromatography with Flame Ionization Detector) and GC-MS (Gas Chromatography coupled to Mass Spectrometry) showing a composition close to that currently accepted for Spanish sage essential oil in the European Pharmacopoeia, ISO (International Standard Organization) and UNE (Una Norma Española) standards, with 1,8-cineole (13.7–45.7%) and camphor (12.1–28.6%) as major constituents. HPTLC methods, based on the analysis of hydroalcoholic and dichloromethane extracts, allowed to distinguish SB from other Salvia taxa currently found in Valencia region, except from its hybrid SH. This interdisciplinary study, that combines popular knowledge with botany and chemistry, allows to identify the raw herbal material from SB and to distinguish it from other Salvia species, ensuring a proper commercialization as herbal teas or for the preparation of spirits. The promotion of European plant derived products (particularly those coming from rural areas), such as, wines and spirits, with specific characteristics determined by the geographical origin, including the area of production, has experienced a significant increase, especially in the last decade (Qin et al., 2012). This reflects the large popularity of these local products, which particularly in Spain benefit from a great acceptance. Some examples of Protected Geographical Indications (PGI) include liquors, such as, “Cantueso alicantino,” “Palo de Mallorca” or “Ratafía catalana”; anise-flavored spirits like “Anís Paloma Monforte del Cid,” “Hierbas Ibicencas” and “Hierbas de Mallorca”; or other alcoholic drinks, such as, “Herbero de la Sierra Mariola,” “Aperitivo Café de Alcoy,” “Aguardiente de hierbas de Galicia,” and “Pacharán de Navarra” (E-Spirits-Drinks, 2017). Many of them are made in the Eastern part of the Iberian Peninsula or in the Balearic Islands as an evolution of traditional herbal preparations, which nowadays have a social use as drinks in family gatherings and festivals. Most of the ingredients in these preparations are aromatic plants that have been used in traditional medicine for centuries (Liang et al., 2004; Bouaziz et al., 2009). The majority are Lamiaceae, such as, Salvia species, intensively studied because of their economic interest for food, cosmetic, and pharmaceutical preparations (Durling et al., 2007; Longaray Delamare et al., 2007; Walch et al., 2011; Orhan et al., 2012). In particular, S. officinalis L. subsp. officinalis and S. officinalis L. subsp. lavandulifolia (Vahl) Gams (syn. S. lavandulifolia Vahl) have been largely investigated due to their biological activities as anti-nociceptive, anti-inflammatory, antioxidant and inhibitor of cholinesterase activity (Bakkali et al., 2008; Adorjan and Buchbauer, 2010; Ramos et al., 2010; Kennedy and Wightman, 2011; Walch et al., 2011). In addition, S. officinalis subsp. lavandulifolia is the accepted source for the Spanish sage oil in the European Pharmacopoeia (EDQM, 2016) and other standards (AENOR, 2001; ISO, 2005). In Valencian region (Spain), several wild and cultivated Salvia species are traditionally used in folk medicine as herbal tea or for digestive liquors (Martínez-Francés and Ríos, 2005). Among them, S. blancoana Webb. Heldr. subsp. mariolensis Figuerola, an Iberolevantine endemism, S. officinalis subsp. lavandulifolia and their hybrid S. x hegelmaieri Porta Rigo, are increasingly found in local markets, especially in the Southern part of Valencia region (Martínez-Francés et al., 2012). Thus, quality control of the herbal raw material is important for a proper commercialization of these species. Identification using morphological and/or chemical markers is an essential step of this control. Taxonomy of Iberian Salvia species related to S. officinalis, such as, S. blancoana, and the previously known as S. lavandulifolia, is controversial regarding their status and level (Alcaraz and De la Torre, 1988; Alcaraz et al., 1988; Bolòs and Vigo, 1995; Laguna et al., 1998; López, 2001; Reales et al., 2004; Serra, 2007; Sáez, 2010; Mateo and Crespo, 2014). In the case of S. blancoana, a consensus exist of its status as species, including several subspecies, among them S. blancoana subsp. mariolensis (Laguna et al., 1998; Reales et al., 2004; Serra, 2007; Mateo and Crespo, 2014) which is mainly distributed in the Alcoy—Denia eastern mountains, reaching the Ayora—Villena western mountains, a region between North of Alicante province and South of Valencia province (Serra, 2007). Essential oil composition of Iberian sages has been extensively studied (Marcos Sanz et al., 1988; Guillén and Manzanos, 1999; Jordán et al., 2009; Herraiz-Peñalver et al., 2010; Ramos et al., 2010; Martínez-Francés et al., 2012; Santana et al., 2012). However, an exhaustive chemical characterization of the oil of S. blancoana subsp. mariolensis an S. x hegelmaieri is lacking. There is a need of a better morphological and chemical knowledge of S. blancoana subsp. mariolensis, which could help the establishment of quality specifications for the herbal materials and improve the opportunities of marketing the herbal preparations thereof such as, teas and traditional liquors under controlled conditions. For this reason, the aims of the present paper were: to analyze the ethnopharmacological knowledge reported about S. blancoana subsp. mariolensis in comparison with S. officinalis subsp. lavandulifolia; to clarify the main morphological characters that can help the identification and differentiation of the sages marketed in the studied area; to characterize the essential oil of S. blancoana subsp. mariolensis by GC-FID (Gas Chromatography with Flame Ionization Detector) and GC-MS (Gas Chromatography coupled to Mass Spectrometry) and comparing its composition with those of closely related taxa; and to develop a method of identification by HPTLC (High Performance Thin Layer Chromatography) to distinguish S. blancoana subsp. mariolensis from other Salvia taxa currently found in Valencia region, that could be routinely applied for quality control of herbal material. This study has been carried along the mountainous areas of Valencia region (which includes the administrative provinces of Castellón, Valencia and Alicante) and bordering ones of Aragón, Castilla-La Mancha and Murcia regions. The region, located at the East and Southeast of Spain, comprises a thin coastal strip with wetlands and a fertile plain giving way in a few kilometers to a craggy inland territory in the West, with some high peaks (Figure 1). Figure 1. Map of the collection sites of the Salvia taxa studied (for identification codes, see Table 1). The ethnopharmacological field study was carried out between 2009 and 2012, with semi-structured interviews with male and female informants randomly selected. The study was carried out in accordance with the recommendations of the Code of Ethics of the International Society of Ethnobiology (2006). Ethics approval was not required as per the author's institutions guidelines and national regulations. Verbal informed consent was obtained from each informant prior the interview. In this process, the objectives of the research, the topics and procedures for the interview and the general outcomes expected were presented to the informant and both confidentiality and complete anonymity were guaranteed. The consent of the informant was audio recorded. Only non-sensitive personal data were collected. Although elders were the most interesting informants, a few younger people were also interviewed in order to determine the intergenerational transmission of herbal knowledge (Martínez-Francés et al., 2012). Literature search for additional ethnopharmacological data has also been performed. Aerial parts of six populations of Salvia blancoana subsp. mariolensis, two of S. officinalis subsp. lavandulifolia, and one of S. x hegelmaieri, S. officinalis subsp. officinalis, S. x auriculata, and S. microphylla var. microphylla were collected during flowering stage in June-July 2010 in different localities from Valencia region (Spain). In addition, two more samples, one of S. blancoana subsp. mariolensis and another of S. officinalis subsp. lavandulifolia were collected in winter time, with the aim of detecting seasonal changes in their essential oil composition (Table 1, Figure 1). Plant material was air-dried at room temperature in a dark, dry place and later stored until used. Table 1. Collection data and essential oil yield for the aerial pats of the Salvia taxa studied. Identification of plant material was carried out using a stereomicroscope with the aid of literature data (Bolòs and Vigo, 1995; Laguna et al., 1998; López, 2001; Reales et al., 2004; Serra, 2007; Sáez, 2010; Mateo and Crespo, 2014). A voucher of each sample was deposited in the Herbarium BCF of the University of Barcelona (Barcelona, Spain) (Table 1). Anisaldehyde (Ref. : A88107), diphenylboric acid aminoethyl ester (Ref. : 42810), PEG 400 (Ref. : P3265), and rutin (Ref. : 78095) were obtained from Sigma Chemical Company (St. Louis, MO, USA). Eupatorin was from our own laboratory collection (previously isolated from Salvia officinalis subsp. lavandulifolia leaves). Acetic acid, formic acid, sulfuric acid, dichloromethane, ethanol, ethyl acetate, methanol, and toluene were of analytical grade and purchased from Panreac Química (Barcelona, Spain). HPTLC glass plates coated with Silicagel 60F254 (20 × 10 cm) were purchased from Merck (Darmstadt, Germany; Ref. : 1.05642.0001). Air-dried plant material of each sample (50 g) was submitted to hydrodistillation for 2.5 h using a Clevenger-type apparatus, as described in the European Pharmacopeia (EDQM, 2016). Essential oils were stored in amber colored glass vials at 4°C until analysis. Essential oil yields were determined using the same apparatus and 1,2,3,4-tetramethylbenzene as collector solvent, and were calculated as the mean of three replicates. Two types of extracts were obtained. Powdered air-dried plant material (0.5 g) was sonicated for 15 min with either 5 mL of ethanol/water (50/50, v/v) or 5 mL of dichloromethane. After centrifugation for 10 min, the extracts were filtered through a membrane filter of 45 μm and the supernatants, which were used as test solutions, were stored at 4°C till used. Reference solutions of eupatorin and rutin used for HPTLC analysis of dichloromethane and hydroalcoholic extracts, respectively, were prepared at a concentration of 3 mg/10 mL in methanol and stored at 4°C till used. Essential oil analyses were carried out by GC-FID and GC-MS using two fused silica capillary columns (60 m × 0.25 mm i.d. ; 0.25 μm film thickness) of different stationary phases: Supelcowax™10 and Equity™-1 (both from Supelco, Bellefonte, PA, USA). GC-FID analyses were performed on a Hewlett-Packard (Palo Alto, CA, USA) model 6890 instrument, equipped with a HP GC ChemStation data processor software (version A.07.01), using the following analytical conditions: carrier gas, helium; flow rate, 1 mL/min; oven temperature programmed, 60°C (2 min), 60–180°C at 2°C/min, 180°C (7 min), 180–230°C at 4°C/min, 230°C (15 min), 230–260°C at 10°C/min, 260 °C (8 min); injector temperature, 250°C; detector temperature, 270°C; split ratio 1:100. A volume of 0.1 μL of the undiluted oils was injected. Mass spectra were obtained with a computerized system constituted by a GC Hewlett-Packard 6890 gas chromatograph coupled to a mass selective detector Hewlett-Packard 5973N and equipped with GC-MS ChemStation software (version G1701DA), using the same analytical conditions as above. Transfer line temperature was 280°C. Mass spectra were taken over m/z 35–400, using an ionizing voltage of 70 eV. Identification of essential oil constituents was achieved by means of their GC linear retention indices (RI) in the two stationary phases, determined in relation to a homologous series of n-alkanes (8–23 carbons) and a homologous series of fatty acid methyl esters (methyl esters of fatty acids with 4, 6, 8, 10, 12, 14, 16, and 18 carbon atoms, FAME indices), and comparison of fragmentation patterns in the mass spectra with those stored in our own library or in the GC-MS database and with literature data (Mc Lafferty, 1993; Adams, 2007). Quantification of each compound was performed on the basis of their GC-FID peak areas on the two columns, using the normalization procedure without corrections for response factor. Hydroalcoholic and dichloromethane extracts were analyzed by HPTLC using a CAMAG (Muttenz, Switzerland) system constituted by a semiautomatic TLC Sampler Linomat 5 as application device, an Automatic Development Chamber ADC 2, a TLC Plate Heater III device, a Chromatogram Immersion Device III, Reprostar 3 (Digistore) as chromatogram documentation device, and the software WinCATS 1.4.6. Test solutions were the hydroethanolic and dichlorometane extracts. Aliquots of 4 μL of test and reference solutions were applied on the plates as bands of 8 mm in length (distance from the left edge 15 mm and from the lower edge 8 mm). Plates were developed in ascending mode over a distance of 6 cm from the application position using a twin-through chamber fitted with filter paper previously saturated for 20 min with the mobile phase. Analyses were carried out at constant humidity (33%) at room temperature (23 ± 2°C). Two mobile phases were used depending on the test solutions analyzed: ethyl acetate, acetic acid, formic acid, water (100:10:10:25) for hydroethanolic extracts, and toluene, ethyl acetate, formic acid (70:30:1) for dichloromethane extracts. Derivatization of the plates was carried out by dipping with either the Natural Products Reagent (NPR) and the PEG-400 solution (hydroethanolic extracts), or the anisaldehyde solution (dichloromethane extracts). In the case of hydroethanolic extracts, after elution, the plates were dried in cold air for 5 min, heated at 100°C for 3 min and dipped in the NPR solution (1 g of diphenylboric acid aminoethyl ester in 200 mL of ethyl acetate) while still hot. Once the plates were dried, they were subsequently dipped in the PEG-400 solution (10 g of PEG 400 in 200 mL of dichloromethane) and dried. Evaluation was performed under UV light at 366 nm. In the case of dichloromethane extracts, plates were immersed in anisaldehyde solution, prepared according to the European Pharmacopoeia (EDQM, 2016), and heated at 100°C for 5 min. They were examined immediately in daylight and eventually under UV light at 366 nm. The ethnopharmacological study focused on traditional medicinal uses in Valencia region and closest mountainous areas by means of 87 interviews (2009–2012), 61 (33 men and 29 women) in the Valencia region, 19 (men) in Murcia and 6 (4 men and 2 women) in Aragón. The informants interviewed were aged between 24 and 83 years, being 61 the media in both sexes in Valencia region. In this area, nine Salvia species are used in folk medicine (Martínez-Francés et al., 2012). After a botanical identification of the different species used, some samples were collected for performing the chemical characterization (Table 1). The main focus of the present work is on S. blancoana subsp. mariolensis and S. officinalis subsp. lavandulifolia. 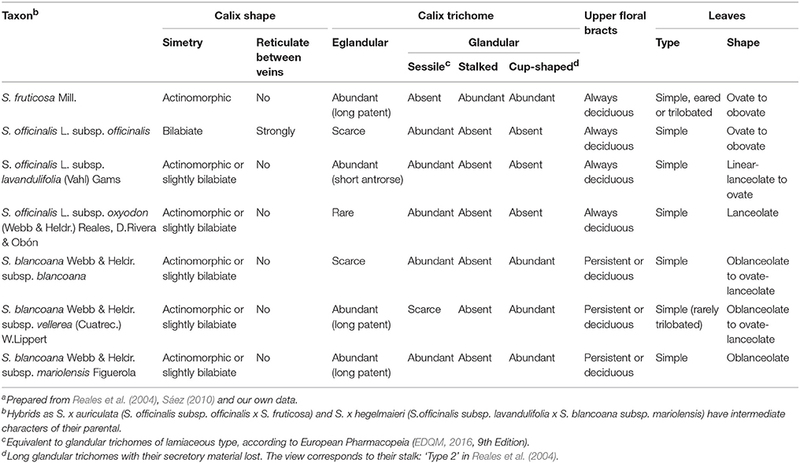 For this reason, own and literature ethnopharmacological data of these two species is summarized in Table 2. Twenty nine medicinal uses were recorded for S. officinalis subsp. lavandulifolia, with a wider distribution area, from which 13 were also shared by S. blancoana subsp. mariolensis. Table 2. Ethnopharmacological evidence for medicinal uses for Salvia blancoana subsp. mariolensis and S. officinalis subsp. lavandulifolia in Valencia region and surrounding areas. In Valencia region, S. blancoana subsp. mariolensis is often used to treat diseases of the circulatory, respiratory, digestive and genitourinary systems. Its aerial parts are commonly used as a tea, alone or mixed with other species. Informants believe that these preparations are hypotensive, antitussive or anti-cold, tonic-digestive, emmenagogue, febrifuge, sedative, and detoxifying. The local vernacular names are sàlvia, sàlvia de la Mariola, sàlvia de serra, sàlvia blanca, and savia (Pérez, 2011; Martínez-Francés et al., 2012) and it is considered the best sage for medicinal purposes. Salvia officinalis subsp. lavandulifolia has similar uses in Valencia region, where it is known as sàlvia, sàlvia de serra, sàvia, sava, sèrvia, and sèlvia. Infrequent uses, are related to eye, skin, or the musculoskeletal or nervous system. In Castellón province, it is used in inhalation fumes for migraines, as ophthalmic antiinflamatory and for rheumatism. In the Aragonese borderlands, this sage is less frequent and less cited, although it is highly prized; it is known as sàlvia, sàlvia d'Aragó, estepera, and as salvia de Penyagolosa (mountain of Valencia region where it is collected). The main traditional uses in Aragon are as digestive and depurative, and it is considered very effective against menstrual problems and to eliminate the bad odor of the feet. In Murcia region, S. officinalis subsp. lavandulifolia is locally known as manisierva, manisielva, marisielva, mariselva, mariserva, marisierva, salvia, and savia. It is used for the same purposes cited above, but also as aperitif (Obón and Rivera, 1991) and as masticatory to clean the teeth. The last use is also found in Albacete (Castilla—La Mancha), where, macerated in alcohol, is additionally employed for rubbing back and chest to relieve fatigue. The decoction has been used as gargle for snoring and sore throats (Verde et al., 2008). In Albacete, bordering Valencia region, this species and the hybrid S. x hegelamieri, are indistinctly employed. For S. officinalis subsp. lavandulifolia, some popular names, marisielva, marisilva, salvia, savia, selva, sielva, and sierva, resemble to those collected in Murcia and Valencia regions. The alcoholic preparation known as “salvieta” or “licor de salvia” (sage liquor), which is used as digestive, is especially made in S. blancoana subsp. mariolensis distribution area (Martínez-Francés et al., 2012). “Salvieta” is a homemade anise-flavored alcoholic maceration of the aerial parts of S. blancoana subsp. mariolensis, alone or, rarely, mixed with other sages, such as, S. officinalis subsp. officinalis, S. officinalis subsp. lavandulifolia, and S. microphylla var. microphylla. Nowadays this local product has not a great demand outside the zone of preparation, but some small industries of this area are already marketing the raw material for teas or as a kit for a homemade liquor elaboration. However, there is a potential market for this sage liquor, because its consumption in local festivities and annual fairs are consolidating its use among the youngest. To prevent adulterations, a correct identification of the raw material is necessary. It is a common criterion to consider S. officinalis subsp. officinalis, traditionally cultivated in Spain for centuries, as an introduced species from the Eastern Mediterranean along with other species, such as, S. fruticosa and S. x auriculata Mill., an hybrid of both (Reales et al., 2004). Concerning S. officinalis subsp. lavandulifolia, its independence (as S. lavandulifolia) was recognized by several authors. Nevertheless, Bolòs and Vigo (1995) and, more recently, Reales et al. (2004) subordinated it to S. officinalis, mainly due to the high coincidence of the indumentum of the calyx. This criterion is nowadays internationally accepted (TPL, 2017) and has been followed in the present work. S. microphylla var. microphylla, a foreign species coming from Mexico (Valdés et al., 1995), cultivated in this area for more than 150 years, is also used in Valencian folk medicine together with S. officinalis subsp. officinalis, S. officinalis subsp. lavandulifolia, S. blancoana subsp. mariolensis, and S. x auriculata. All of them have been collected for morphological and chemical characterization. As it has been exposed above, discrepancies between Spanish botanists on the classification of Salvia taxa greatly complicate the identification of the raw material for the liquor and herbal markets, in which an unambiguous identification should be a priority before commercialization. In order to avoid misunderstanding, the taxonomic treatment proposed by Reales et al. (2004) and Sáez (2010) is followed here. Salvia officinalis related sages present in the Iberian Peninsula are organized in seven taxa: Salvia fruticosa Mill., S. officinalis L. subsp. officinalis, S. officinalis L. subsp. lavandulifolia (Vahl) Gram, S. officinalis L. subsp. oxyodon (Webb & Heldr.) Reales, D.Rivera & Obón, S. blancoana Webb and Heldr. subsp. blancoana, S. blancoana Webb & Heldr. subsp. vellerea (Cuatrec.) W. Lippert, S. blancoana Webb and Heldr. subsp. mariolensis Figuerola, and two of their hybrids: S. x auriculata Mill. (S. officinalis subsp. officinalis x S. fruticosa) and S. x hegelmaieri Porta Rigo (S. officinalis subsp. lavandulifolia x S. blancoana subsp. mariolensis). Macro and micromorphological characters are useful for the identification of the different Iberian Salvia subgenus Salvia taxa related to S. officinalis. As it is shown in Table 3, leaves of S. blancoana subsp. mariolensis are oblanceolate, while those of S. officinalis subsp. lavandulifolia are linear-lanceolate and those of S. officinalis subsp. officinalis and S. fruticosa are ovate. Salvia blancoana subsp. mariolensis present persistent upper floral bracts in contrast with the rest. The presence of cup-shaped glandular trichomes and long patent eglandular trichomes can separate it from S. officinalis subsp. lavandulifolia. Salvia blancoana subsp. mariolensis and S. blancoana subsp. vellerea, with different distribution areas, exhibit different type of leaves, the second lacking sessile glands. Salvia microphylla var. microphylla (subgenus Calosphace), is not included in Table 3 due to its distinct morphology, especially its delta-shaped leaves and red flowers, which clearly differentiates it from the other sages. The raw herbal material from all these taxa is frequently dried and cut before marketed, making even more difficult its identification. Therefore, other techniques, such as, chemical profiling, are useful. Table 3. Main macro and micromorphological characters for identification of the aerial parts of some taxa of Salvia traditionally used in the Iberian Peninsulaa. In order to contribute to the chemical characterization of S. blancoana subsp. mariolensis, the essential oil contents of the air-dried aerial parts of seven samples of this taxon have been determined and compared with those obtained for samples of other sages used in the region (Table 1). 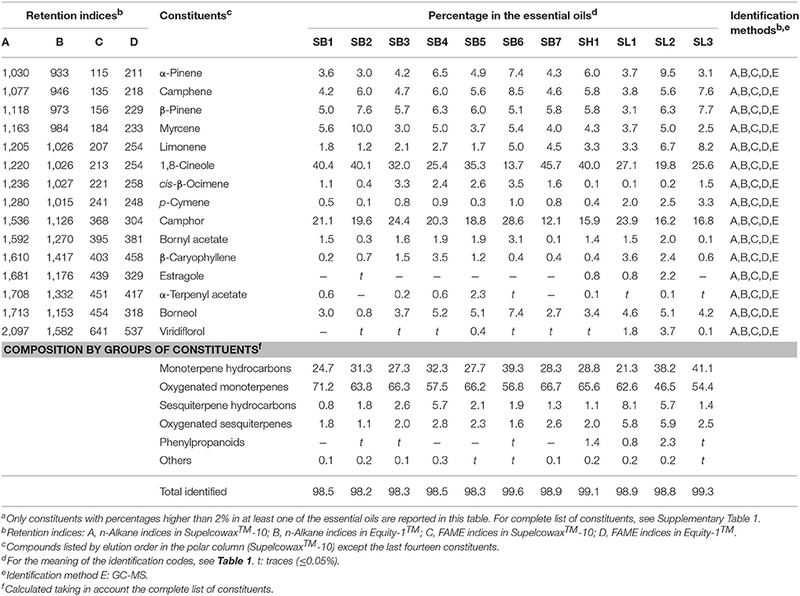 The essential oil content (% v/w) of S. blancoana subsp. mariolensis was in general higher than 2% (1.8–4.5%), even for a sample collected in winter (SB7), which yielded 3.8% of oil. Only one sample (SB4) gave a lower yield (1.8%). The essential oil contents of the three samples of S. officinalis subsp. lavandulifolia were always below 2% (1.2–1.3%) and lower than those shown by S. blancoana subsp. mariolensis. Finally, their hybrid, S. x hegelmaieri, gave a content of 2.5%, which is in between of those shown by the parent taxa. It is the first time that the detailed composition of the essential oil of S. blancoana subsp. mariolensis is described. Only some preliminary data were previously published by us (Martínez-Francés et al., 2012). In the present work, the essential oils distilled from the air-dried aerial parts of seven samples of this taxon (SB1–SB7), collected in different locations and including wild and cultivated plant material, were submitted to exhaustive analysis by GC-FID and GC-MS. The results, which are shown in Table 4 (main constituents) and Supplementary Table 1 (complete list of constituents), were compared with those given by the oils of three samples of S. officinalis subsp. lavandulifolia (SL1–SL3). In addition, the composition of the essential oil of the aerial parts of S. x hegelmaieri, the hybrid of the two former taxa growing in the same geographical area, is reported for the first time (Table 4, Supplementary Table 1). Table 4. Composition of the essential oils of Salvia blancoana subsp. mariolensis, S. x hegelmaieri and S. officinalis subsp. lavandulifolia from the Valencia region (Spain) and close areasa. More than 98% of each essential oil was identified, which, considering all the samples analyzed, involved a total of 174 constituents. In all cases, the main group of constituents were oxygenated monoterpenes (46.5–71.2%), followed by monoterpene hydrocarbons (21.3–41.1%). The essential oil of S. blancoana subsp. mariolensis is characterized by 1,8-cineole (13.7–45.7%) and camphor (12.1–28.6%) as major constituents, followed by myrcene (3.0–5.6%), α-pinene (3.0–7.4%), camphene (4.2–8.5%), β-pinene (5.0–7.6%), limonene (1.7–5.0%), and borneol (0.8–7.4%). Among sesquiterpenes (2.6–8.5%), β-caryophyllene (0.2–3.5%), β-caryophyllene oxide (0.3–1.2%), and spathulenol (0.2–1.3%) reached the higher percentages. The essential oil of S. x hegelmaieri showed a similar pattern, with 1,8-cineole (40.0%), camphor (15.9%), α-pinene (6.0%), camphene (5.8%), β-pinene (5.8%), myrcene (4.3%), borneol (3.4%), and limonene (3.3%) as the main constituents. As it can be seen in Table 4, the essential oils of the three taxa analyzed showed a similar profile, mainly concerning their major constituents. They are, in general, in accordance with those previously reported for the essential oils from S. officinalis subsp. lavandulifolia (Lawrence et al., 1970; Marcos Sanz et al., 1988; Martínez-Francés et al., 2012; Usano-Alemany, 2012), with 1,8-cineole and camphor as major constituents. However, some minor distinguishing features could be recognized. In fact, p-cymene was found in the three samples of S. officinalis subsp. lavandulifolia in a range from 2.0 to 3.3%, while it did not reach 1% either in S. blancoana subsp. mariolensis or in S. x hegelmaieri. Furthermore, the phenylpropanoid estragole was detected in traces in only one sample from S. blancoana subsp. mariolensis, whereas it was found in S. x hegelmaieri (0.8%) and two samples of S. officinalis subsp. lavandulifolia (0.8 and 2.2%). In order to investigate seasonal variations in the essential oil composition of S. blancoana subsp. mariolensis and S. officinalis subsp. lavandulifolia, two samples were collected at winter time (SB7 and SL3, respectively). In general, the chromatographic profile of the latter was inside the range found for spring-early summer samples of S. officinalis subsp. lavandulifolia. Nevertheless, in the case of S. blancoana subsp. mariolensis, the essential oil of the winter sample (SB7) showed a significantly higher percentage of 1,8-cineole and a lower percentage of camphor, the two major constituents, when compared to the essential oils from samples collected in late spring-early summer (SB1–SB6). In addition to the similarity of the composition of the essential oils of the three taxa investigated, it is noteworthy to remark that they show chromatographic profiles that are mostly in accordance with those prescribed in the current standards for “Spanish sage oil” in the European Pharmacopoeia (EDQM, 2016) (monograph 1849), for “oil of sage, Spanish” by the International Organization for Standardization (standard ISO 3526) (ISO, 2005) and for “aceite esencial de salvia de España” by the Spanish Association for Standardization (AENOR, standard UNE 84310) (AENOR, 2001; Table 5). Minor differences can be observed, that could be due to the fact that the essential oils studied here were hydrodistilled in the laboratory from small amounts of dried plant material, whereas standards are established for essential oils obtained by steam distillation at industrial scale. The species accepted for the preparation of the essential oil in these standards is S. lavandulifolia (referred here as S. officinalis subsp. lavandulifolia). Nevertheless, according to our results, also S. blancoana subsp. mariolensis should be considered as a possible source of this oil. In fact, this endemic Levantine sage appears in a small mountainous area between northern Alicante and southern Valencia provinces, immersed within the wide distribution area of S. officinalis subsp. lavandulifolia. Therefore, when wildgrowing, these two sages could be collected without any distinction. Table 5. Comparison of the composition found for the essential oils from S. blancoana subsp. mariolensis, S. x hegelmaieri and S. officinalis subsp. lavandulifolia to the current requirements for Spanish sage oil in the standards from the European Pharmacopoeia (EDQM, 2016) (monograph 1849), ISO (2005) (standard ISO 3526) and AENOR (2001) (standard UNE 84310). The essential oil of S. officinalis subsp. lavandulifolia, after a single oral dose of 50 μL, has shown to improve cognitive function in healthy humans compared to placebo, specially the performance of secondary memory and attention tasks (Kennedy et al., 2011). This effect has been mainly related to the inhibition of acetylcholinesterase by the oil, 1,8-cineol followed by α-pinene being the most active constituents (Perry et al., 2003; Kennedy et al., 2011). Taking in account the similarity in composition with the essential oil of S. blancoana subsp. mariolensis, which is particularly rich in 1,8-cineol, the effect on cognitive function could also be expected from the oil of this species. Finally, it is important to remark that α-thujone and β-thujone are absent or only found in traces in the essential oils of S. blancoana subsp. mariolensis, S. officinalis subsp. lavandulifolia, and S. x hegelmaieri. Due to its activity on the central nervous system, thujone is considered toxic, especially the α isomer which is the most potent, and the control of its content in foods and medicines is necessary (Emmert et al., 2004). The low content/absence of thujone in the essential oils analyzed here is important in order to avoid any safety concern for this reason in relation to the herbal products and, specially, the liquors prepared thereof, since they will follow the recommendations of the European Medicines Agency for herbal medicinal products (EMA, 2011), and the regulations for alcoholic and non-alcoholic beverages established in the European Directive 1334/2008/EC (European Parliament and Council, 2008). With the aim of setting a simple test allowing an easy distinction of plant material coming from different species, hydroalcoholic and dichloromethane extracts of the dried aerial parts of the taxa were analyzed by HPTLC according to the methods described in the experimental section. Two HPTLC systems with optimized mobile phases were developed for the analysis of each type of extract. Figure 2 shows the HPTLC chromatograms of the hydroalcoholic extracts examined under UV light at 366 nm after derivatization with NPR and PEG-400 solution. With this system, the chromatographic profiles of S. blancoana subsp. mariolensis, S. officinalis subsp. lavandulifolia, and S. x hegelmaieri were very similar to each other with only slight differences concerning the intensities of certain zones. The only remarkable difference is a fluorescent blue zone at Rf 0.4 present in the case of S. officinalis subsp. lavandulifolia, which is not observed in S. blancoana subsp. mariolensis nor in S. x hegelmaieri. High similarity is also observed between S. officinalis subsp. officinalis and S. x auriculata, which, nevertheless, could be distinguished from the former three thanks to the presence of one additional orange fluorescent zone in the lower third of the chromatogram and the much higher intensity of the lower of the two orange fluorescent zones present in the middle third. Finally, the hydroalcoholic extract of S. microphylla var. microphylla showed a clearly different chromatographic profile from all other taxa analyzed, mainly due to the presence, in the middle third, of one intense blue fluorescent zone (Rf 0.45) and a yellow fluorescent zone (Rf 0.49), which are absent in the other taxa. Thus, the fingerprints obtained with the hydroalcoholic extracts are not useful enough for the distinction of S. blancoana subsp. mariolensis from S. officinalis subsp. lavandulifolia. Although these two taxa have partially similar uses, they do not have overlapping distribution and the former constitutes a local resource for inland highland areas of Alicante province. For a potential commercialization and valorization of the traditional beverage “salvieta,” used only in this area, it is worth to set up a suitable HPTLC system for differentiating these two species. Figure 2. HPTLC fingerprints of hydroalcoholic extracts of the aerial parts of Salvia species used in Valencian folk medicine. Mobile phase: Ethyl acetate:formic acid:acetic acid:water (100:10:10:25). Derivatization: NPR + PEG 400, UV 366 nm. Track identification: SB1 to SB5, S. blancoana subsp. mariolensis; SH1, S. x hegelmaieri; SL2 and SL3, S. officinalis subsp. lavandulifolia; SO1, S. officinalis subsp. officinalis; SA1, S. x auriculata; SM1, S. microphylla var. microphylla. 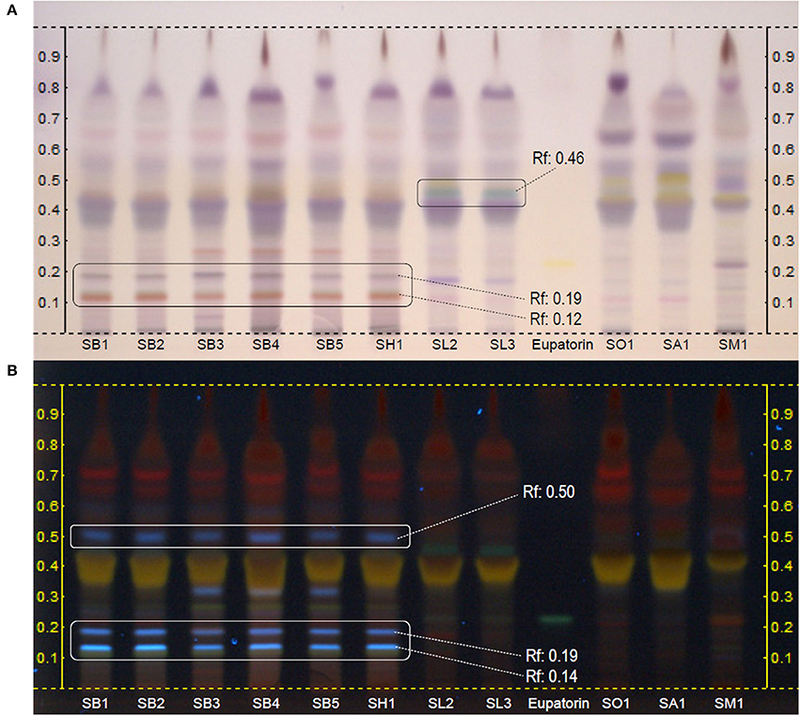 The HPTLC analysis of dichloromethane extracts derivatized with anisaldehyde reagent and examined under daylight or UV 366 nm, provided characteristic fingerprints for most of the taxa analyzed, as it is shown in Figure 3. All samples of S. blancoana subsp. mariolensis (SB1-SB5) showed a homogeneous fingerprint, which was similar to the one obtained with S. x hegelmaieri, a hybrid of the former, botanically very close. These two taxa were clearly differentiated from the others by two zones observed at daylight, appearing in the lower part of the chromatogram (Figure 3A), at Rf 0.12 (red-brown) and Rf 0.19 (gray-blue). Furthermore, examination of the plate under UV light at 366 nm (Figure 3B) showed three blue fluorescent bands at Rf 0.12, Rf 0.14 and Rf 0.50 which were absent in the other taxa. Therefore, all these zones might be considered as specific markers for S. blancoana subsp. mariolensis and S. x hegelmaieri. In the case of S. officinalis subsp. lavandulifolia, a blue-green zone in the middle third (Rf 0.45) of the chromatogram observed under white light (Figure 3A) appears to be characteristic of this taxon. This zone is also seen under UV light at 366 nm as a greenish gray zone (Figure 3B). The fingerprints of the cultivated species S. officinalis subsp. officinalis, S. x auriculata, and S. microphylla var. microphylla showed visible differences after derivatization of the plates with anisaldehyde and observation under white light (Figure 3A). The traditional uses of S. blancoana subsp. mariolensis are close to those of S. officinalis subsp. lavandulifolia, but in a fewer number. Some morphological characters of the first species can discriminate it from the second one, as well as from other Salvia species. Nevertheless, identification using macro and micromorphological characters can be difficult when the raw herbal material is dried and cut, and is not possible in the case of extracts. In this context, the proposed HPTLC fingerprinting allows to discriminate the species and is suitable for quality control of the herbal material of S. blancoana subsp. mariolensis used in the preparation of herbal products and liquors. The composition of the essential oils of S. officinalis subsp. lavandulifolia, S. blancoana subsp. mariolensis and their hybrid S x hegelmaieri is very similar, and mostly in accordance with the chromatographic profile prescribed in the current standards of the European Pharmacopeia, ISO and AENOR for the “Spanish sage oil.” Therefore, S. blancoana subsp. mariolensis and its hybrid should be considered as suitable sources of the oil together with the accepted S. officinalis subsp. lavandulifolia. There is no safety concern related to the content of thujone for the consumption of the traditional liquors homemade from these species, since this compound is only found in trace amounts in their essential oils. VM, SR, and DR were responsible for field work, interviews, collection and identification of samples and ethnopharmacological analysis. EH, VM, RV, ER, and SC designed and performed the chemical analysis. RV, VM, DR, and SC responsible for writing the manuscript. All authors proof read manuscript and made contributions to the final version. This work had the financial support through the Borsa d'Estudi Països Catalans of the Institute for Catalan Studies to VM, and the financial support from an ERASMUS Internship (FsTRASBO48) to EH. The reviewer RM and handling Editor declared their shared affiliation, and the handling Editor states that the process nevertheless met the standards of a fair and objective review. The authors are grateful to the help of Fundación Maria Francisca de Roviralta for the acquisition of laboratory equipment. Adams, R. P. (2007). 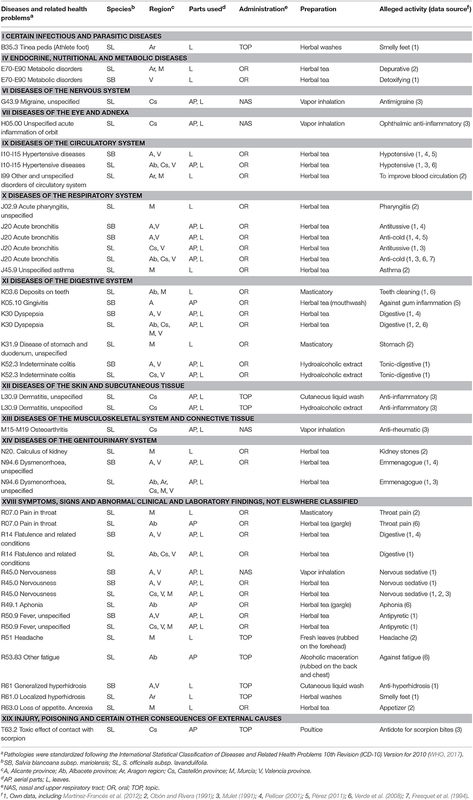 Identification of Essential Oil Components by Gas Chromatography/Mass Spectroscopy, 4th Edn. Carol Stream, IL: Allured Publishing. AENOR (2001). Standard UNE 84310. Aceite Esencial de Salvia de España (Salvia lavandulifolia Vahl.). Madrid: Asociación Española de Normalización y Certificación. Alcaraz, F., and De la Torre, A. (1988). Notas fitosociológicas sobre el Sudeste Ibérico. Acta Bot. Malacit. 13, 332–341. Alcaraz, F., Sánchez Gómez, P., and Correal, E. (1988). Catálogo de las Plantas Aromáticas, Condimentarias y Medicinales de la Región de Murcia. I. Labiadas. Madrid: INIA. Bolòs, O., and Vigo, J. (1995). Flora dels Països Catalans, III. Pirolàcies-Compostes. Barcelona: Ed. Barcino. EDQM (2016). European Pharmacopoeia 9th Edn. Strasbourg: European Directorate for the Quality of Medicines and Health Care. EMA (2011). EMA/HMPC/732886/2010. Public Statement on the Use of Herbal Medicinal Products Containing Thujone. London: European Medicines Agency. Emmert, J., Sartor, G., Sporer, F., and Gummersbach, J. (2004). Determination of α-/β-thujone and related terpenes in absinthe using solid phase extraction and gas chromatography. Deut. Lebensm. Rundschau 100, 352–356. E-Spirits-Drinks (2017). Database on Geographical Indications Protected in the European Community for Spirits Originating in Member States and Third Countries [Internet]. Brussels: European Commission. Available online at: http://ec.europa.eu/agriculture/spirits (Accessed March 20, 2017). European Parliament and Council (2008). Regulation (EC) No 1334/2008 of the European Parliament and of the Council of 16 December 2008 on Flavourings and Certain Food Ingredients with Flavouring Properties for Use in and on Foods and Amending Council Regulation (EEC) No 1601/91, Regulations (EC) No 2232/96 and (EC) No 110/2008 and Directive 2000/13/EC. Official Journal of the European Union. Fresquet, J. L., Tronchoni, J. A., Ferrer, F., and Bordallo, A. (1994). Salut, Malaltia i Terapèutica Popular. Els Municipis Riberencs de l'Albufera. Catarroja: Servei de publicacions ajuntament de Catarroja. International Society of Ethnobiology (2006). ISE Code of Ethics (with 2008 Additions) [Internet]. Bristol, VT: International Society of Ethnobiology Available online at: http://ethnobiology.net/code-of-ethics/ (Accesssed March 28, 2017). ISO (2005). Standard ISO 3526. Oil of Sage, Spanish (Salvia lavandulifolia Vahl.). Geneva: International Standards Organization. Laguna, E., Crespo, M. B., Mateo, G., López, S., Fabregat, C., Serra, L., et al. (1998). Flora Endémica Rara o Amenazada de la Comunidad Valenciana. Valencia: Generalitat Valenciana; Conselleria de Medio Ambiente. López, G. (2001). Los Árboles y Arbustos de la Península Ibérica e Islas Baleares. Madrid: Mundi-Prensa. Marcos Sanz, M. E., García Vallejo, M. C., Muñoz López-Bustamante, F., and Polo Diez, L. M. (1988). Essential oils of Salvia lavandulaefolia Vahl. Dev. Food Sci. 18, 157–160. Martínez-Francés, V., and Ríos, S. (2005). “Lesser known herbal spirits of Valencia and Alicante provinces of Southeastern Spain,” in Industrial Crops and Rural Development, eds M. J. Villalobos, F. S. Nakayama, C. A. Bailey, E. Correal, and W. W. Schloman (Murcia: IMIDA), 417–426. Mateo, G., and Crespo, B. (2014). Claves Ilustradas Para la Flora Valenciana. Jaca: Jolube Consultor Botánico y Editor. Mc Lafferty, F. W. (1993). Registry of Mass Spectral Data. New York, NY: John Wiley. Mulet, L. (1991). Estudio Etnobotánico de la Provincia de Castellón. Castellón: Diputación de Castellón. Obón, C., and Rivera, D. (1991). Las Plantas Medicinales de Nuestra Región. Murcia: ARMAN-Editora Regional de Murcia. Pellicer, J. (2001). Costumari Botànic. Recerques Etnobotàniques a les Comarques Centrals Valencianes, 2nd Edn. Picanya: Edicions Bullent. Pérez, M. (2011). Estudio de los Usos Tradicionales de las Plantas en la Foia de Castalla (Alicante). Oficial Master, Universidad Miguel Hernández, Orihuela. Sáez, L. (2010). “Salvia L.,” in Flora Ibérica. Verbenaceae-Labiatae-Callitrichaceae, eds R. Morales, A. Quintanar, F. Cabezas, A. J. Pujadas, and S. Cirujano, (Madrid: CSIC), 298–326. Serra, L. (2007). Estudio Crítico de la Flora Vascular de la Provincia de Alicante: Aspectos Nomenclaturales, Biogeográficos y de Conservación. Madrid: CSIC. TPL (2017). The Plant List. Version 1.1 [Internet] Unknown: Royal Botanic Gardens, Kew and Missouri Botanical Garden. Available online at: www.theplantlist.org (Accessed March 20, 2017). Usano-Alemany, J. (2012). Estudio del Efecto de Los Factores Ambientales y Agronómicos Sobre la Producción de los Aceites Esenciales de Salvia lavandulifolia Vahl. Ph.D. thesis, Universidad Complutense de Madrid, Madrid. Valdés, B., Martín, M., and Díaz, Z. (1995). Introducción de plantas ornamentales leñosas americanas. Bot. Macaron. 21, 107–120. Verde, A., Rivera, D., Fajardo, J., Obón, C., and Cebrian, F. (2008). Guía de las Plantas Medicinales de Castilla-La Mancha (y otros recursos Medicinales de uso Tradicional). Albacete:Ăltabán Ediciones. WHO (2017). International Statistical Classification of Diseases and Related Health Problems 10th Revision (ICD-10 Version:2010) [Internet]. Geneva: World Health Organization. Available online at: http://apps.who.int/classifications/icd10/browse/2010/en (Accessed March 12, 2017). Copyright © 2017 Martínez-Francés, Hahn, Ríos, Rivera, Reich, Vila and Cañigueral. This is an open-access article distributed under the terms of the Creative Commons Attribution License (CC BY). The use, distribution or reproduction in other forums is permitted, provided the original author(s) or licensor are credited and that the original publication in this journal is cited, in accordance with accepted academic practice. No use, distribution or reproduction is permitted which does not comply with these terms.